A rigorous account of the European origins of American art museums American art museums share a mission and format that differ from those of their European counterparts, which often have origins in aristocratic collections. 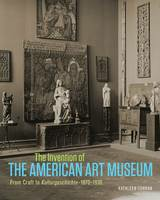 This groundbreaking work recounts the fascinating story of the invention of the modern American art museum, starting with its roots in the 1870s in the craft museum type, which was based on London's South Kensington (now the Victoria and Albert) Museum. At the turn of the twentieth century, American planners grew enthusiastic about a new type of museum and presentation that was developed in Northern Europe, particularly in Germany, Switzerland, and Scandinavia. Called Kulturgeschichte (cultural history) museums, they were evocative displays of regional history. American trustees, museum directors, and curators found that the Kulturgeschichte approach offered a variety of transformational options in planning museums, classifying and displaying objects, and broadening collecting categories, including American art and the decorative arts. Leading institutions, including the Museum of Fine Arts, Boston, and the Metropolitan Museum of Art in New York, adopted and developed crucial aspects of the Kulturgeschichte model. By the 1930s, such museum plans and exhibition techniques had become standard practice at museums across the country. KATHLEEN CURRAN is professor of fine arts at Trinity College in Hartford, CT.